Novelist Chuck Hogan '89 works long solitary days. Screenwriter John Jetsyn Taché '84 swims in the Hollywood shark tank. Actor David James Elliott (a friend of Taché's) writes, directs, and produces. Under a new program, "Master Class: Alumni in Residence," the three met with Boston College students in April to talk about the patios they've lived on, the video stores they've clerked in, the surefire hit shows canceled from under their feet, and the lives they've built in fiction, screenwriting, and acting. CRIME NOVELIST Chuck Hogan sat with 10 student writers around a long table in the Haley House conference room, on April 11. Before him were three hardback books in English and two paperbacks in Japanese and Spanish—all with his name printed in block letters on the covers. "This is the thing about being a writer," he said to the students, gesturing toward the books. "No one tells you how to actually do this for a living." 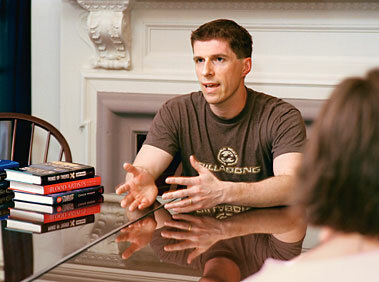 The author of three novels published in 14 languages—The Standoff (Doubleday, 1995), The Blood Artists (William Morrow, 1998), and Prince of Thieves (Scribner, 2004)—Hogan was BC's first guest in the Master Class series, which was developed to draw in alumni artists to talk with students about building a life in the arts. The series is sponsored by Boston College Magazine in conjunction with academic departments. Most of the students meeting with Hogan were English majors with concentrations in creative writing; a few were graduate students; all were aspiring writers who had traded one of the first warm spring afternoons for a chance to speak with a working novelist. Hogan began by outlining his own trajectory toward full-time writing. He knew he wanted to be a writer when he graduated from BC, he told the students, but it was five years before he sold a book: "I wrote my first novel in college and it was terrible." He paused for a moment. "It was about a man who wakes up with amnesia, it was written in present tense." The experience was the important thing, said Hogan. Learning that he was capable of finishing such a project, discovering how much he enjoyed it, and finding support from faculty all helped to build his confidence and motivation to try again. Following graduation, Hogan lived with his parents in Canton, Massachusetts, and worked at a video store. "I arranged my life around writing," he said. "It was very solitary, but it was the only way to get the work done." He sent manuscripts to several agents who rejected his work out of hand. Then, a fellow attendee at a writers' conference gave him the name of another agent to try. Hogan sent her a section of The Standoff, and, housebound for a week by a snowstorm, the agent found herself holed up with the manuscript. "Four days later, she called me up," he told the students, "and we had a deal." The novel appeared on best-seller lists across the country and New Line Cinemas bought the film rights within the year. Hogan's two subsequent books have also fared well, and both have been optioned by Hollywood film companies. When Hogan opened the floor to students' questions, several hands quickly shot up. "How do you discipline yourself to write?" asked Ashley McDonald '05. "How much research do you do before you begin?" Billy Hurley '06 followed up. "How important is getting an agent?" Jordy Clements '06 wanted to know. Hogan described his daily writing routine as dawn to dusk with a break for exercise, though with three children under the age of five, he said, disruptions were now routine, too. "A big part of writing is finding your own method," he said, "your own rhythm. Physically, how are you going to accomplish this?" Research is also key, he told the students. 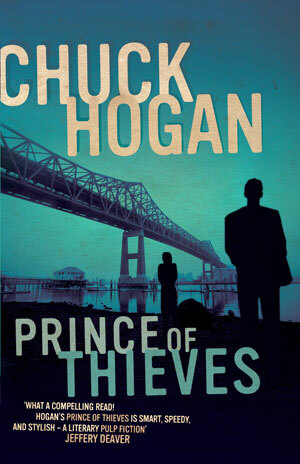 His most recent novel, Prince of Thieves, is set in Boston's working-class section of Charlestown. Hogan was inspired to write the book by a newspaper article that described the neighborhood as "producing more bank robbers and armored-car thieves than any square mile in the world." "It piqued my interest," said Hogan, "but then I had to learn about the area and know it well enough to write about it as if it were my own." Hogan took pictures and notes. He spent mornings in the Lori-Ann Donut Shop, before walking the neighborhood's steeply pitched streets. Nights often ended in Charlestown bars. Hogan talked with people on both sides of the law. He said later, "I find, however, that it is better if they don't know I am an author. They don't self-edit." Hogan credits his agent for turning his literary ambitions into a going concern, brokering deals and contracts he did not even know he could make. "She called me up one day and said, 'We just sold the Italian rights,'" he recalled. "The business of publishing is a whole different world," and whether a book sells can have little to do with artistic merit, he said; if a book doesn't get good reviews within two or three months, stores often will send their copies back to the publisher. And so, publishers develop their own stratagems: different covers for different parts of the country, for example. 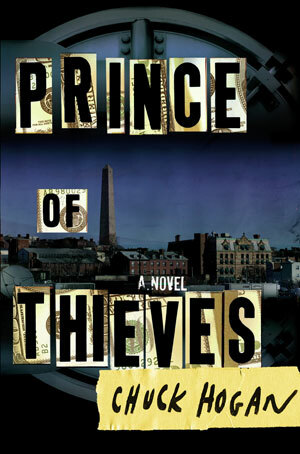 Boston copies of Prince of Thieves sported an image of the Bunker Hill Monument, a Charlestown landmark, on the cover; elsewhere, the illustration showed only a human figure enshrouded in mist. Jacket blurbs by big-name authors who have not necessarily read the book are another marketing tool, Hogan told the students. 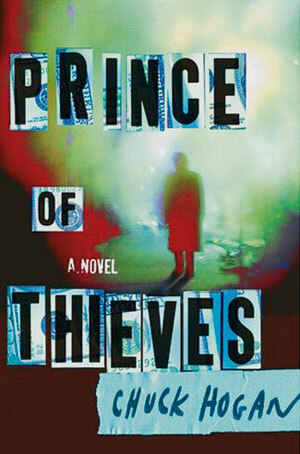 Stephen King's comments on Prince of Thieves—"a terrific read . . . a rich narrative of friendship, young love, and mounting suspense"—were, however, authentic. At a World Series game last fall, a TV sports reporter asked King what he was reading between innings. He held up Hogan's bound galleys. At the close of the two-hour discussion, Jordy Clements approached Hogan. "I just wondered," he said, "really, what kind of living can you make as a writer?" Hogan asked him what kind of writing he was interested in. "Well, that's certainly not the easiest path," said Hogan, with a shrug. "But the truth is, none of them are." 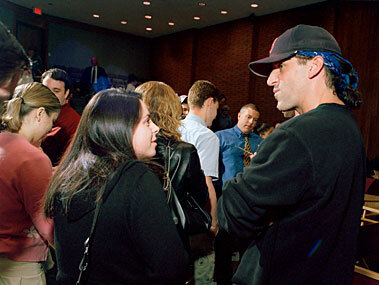 Nearly an hour before David James Elliott, the star of CBS television's JAG, and John Jetsyn Taché, a Hollywood screenwriter, were scheduled to hold their April 19 Master Class in McGuinn auditorium, early birds (BC students, mostly, and women from the local community) had already grabbed front-row seats. Before them, three canvas directors' chairs stood empty, and BC technicians were testing a clip of the JAG theme song. By the time the six-foot-something men strode through a side door—Elliott in a rugged long-john shirt with the sleeves pushed up to his biceps, Taché sporting a faded Red Sox hat (dark ponytail emerging from the back)—the room had nearly filled. "I'll try to do my best James Lipton impression," said Mike Civille, associate professor in the film studies program and the evening's host, holding up a set of blue index cards like the ones used by the host of TV's Inside the Actors Studio. Civille began by asking the guests how they started out in Hollywood, and Taché—a political science major at BC who never wrote a screenplay until two years out of college—answered with a twist of an old adage: "You could be William Shakespeare or Robert Ludlum," he said in a pronounced Boston accent, "but it's who you know and when you know them." Taché moved to L.A. in the early nineties with his twin brother, Joseph '84, and the two started a product-placement company for television and films. "I guess I got in through the backdoor," he said. "Scripts were coming into the office all the time. I met the people at the companies who were sending them . . . and, luckily, I met David [already acting in JAG] early on." The actor got Taché an interview with the studio, and "one of the first TV pieces I wrote was for JAG. Things took off from there." For Elliott, the path was more traditional. "I'm Canadian," he began, "though I didn't mean to be." He paused as the remark prompted laughs, and a string of camera flashes from the audience lit up his face. After acting for years in local Canadian theater and film, he moved to Hollywood and landed a part in the early 1990s syndicated television series The Untouchables. "I remember the casting agent saying, 'Whoever gets this part will be set for life,'" he said. The series ran for one season. In addition to acting, Elliot now writes and directs, often with Taché. He has announced that following the 2004–05 season, which marked his 10th year on JAG and the end of his contract, he is taking a development deal with ABC. Both Taché and Elliott were careful not to sugarcoat their experiences. Hollywood has been described as a land of sharks, said Elliott, "and in many ways, it is." With agents, lawyers, and managers at every turn, artists often have trouble figuring out who their friends are. "Each guy tries to convince you he's the one . . . but all these business guys have dollar signs in their eyes." "So is Hollywood a necessary evil?" asked Civille. "The truth is, you can't be in Boston and go to daily auditions," said Taché. "You can't get an agent, or go to a pitch every day, or know what's going on in the trades. I thought I'd go to Hollywood and sell a script in a week, then go home to my family back here on the East Coast." He ended up living on someone's patio, he said; it took him years to get on his feet. "He has a beautiful house on the water now," Elliott interrupted. "I guess I still consider myself a wannabe," said Taché. "But I suppose I'm in the game." After his hour-long question-and-answer session with the guests, Civille opened the floor to audience questions. Topics ranged from starting out in the trade ("How do you get an agent?" from Sarah Carter '08, a theater major) to behind-the-scenes research at JAG ("How much interaction with actual military personnel do JAG actors have?" from Rebecca Magnone '05, a political science and communication major in Air Force ROTC) to the show's romantic plotline ("My mom . . . wanted me to ask you, When is Elliott's character going to get together with Mac [JAG's female lead]?" from Seanna Mullen '08). "To me, talks like this are gold," said Sean McAvoy '05, a film studies and history double major. McAvoy, who plans to move to Los Angeles a month after graduation, hopes to someday write scripts for feature films. "I waited in line to speak with Taché afterwards," he said, watching the remaining dozens lingering to snap photos and score autographs. "He told me to make sure to have five months' rent, a stack of résumés, and phone numbers of a few people I knew." In his talk, Taché had said that maybe one in 375,000 writers ever sells a major screenplay. Said McAvoy: "I'm going out there because, like him, I want to be that one." Although initially conceived as an opportunity for alumni in the arts to talk with students about careers in the creative fields, the Master Class program will offer an expanded range in 2005–06. Speakers in the coming year will include Boston Police Commissioner Kathleen O'Toole '76 and the comedian Gary Gulman '93.